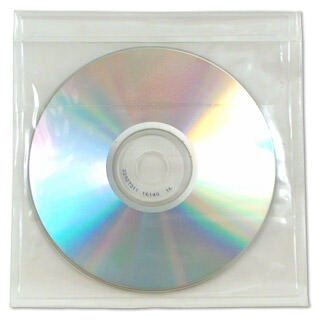 Adhesive CD sleeves, sometimes referred to as security sleeves, are a form of pliable packaging used to store and distribute optical media, specifically CDs and DVDs. They resemble square envelopes and come with or without a fold over flap. They can be made with polypropylene plastic or vinyl plastic. The backs of the sleeves have an adhesive strip which is covered by a tape seal until you need to use it. This unique form of packaging is highly versatile. Once a user places the disc in the sleeve and peels the tape seal, the flaps will stick to virtually any surface. They’re a space saving solution due to their ability to be fastened inside binders and books, providing multi-disc capacity storage. Adhesive CD sleeves are highly accommodating to archiving, display projects, and collector needs. A standout feature is their tamper-resistant design. A security pouch anchors the disc and any tampering leaves evidence due to the perforated seal. This design helps ensure that discs cannot be easily removed. The vinyl or polypropylene plastic composition means that the sleeves are transparent and that the disc’s artwork or label can be fully in view. These materials also shield the disc from scratches, dust buildup, and other external factors that could potentially compromise the artwork and burned data on the CD or DVD. This packaging is constructed in a nearly square shape but vary in their measurements. Generally, they are approximately 5” x 5” with a margin for bigger or smaller sizes. They also come in proportionally sizes for mini CDs, DVDs, or business card discs. Custom CD sleeves are also available and are excellent for personalizing projects or achieving the results you desire.